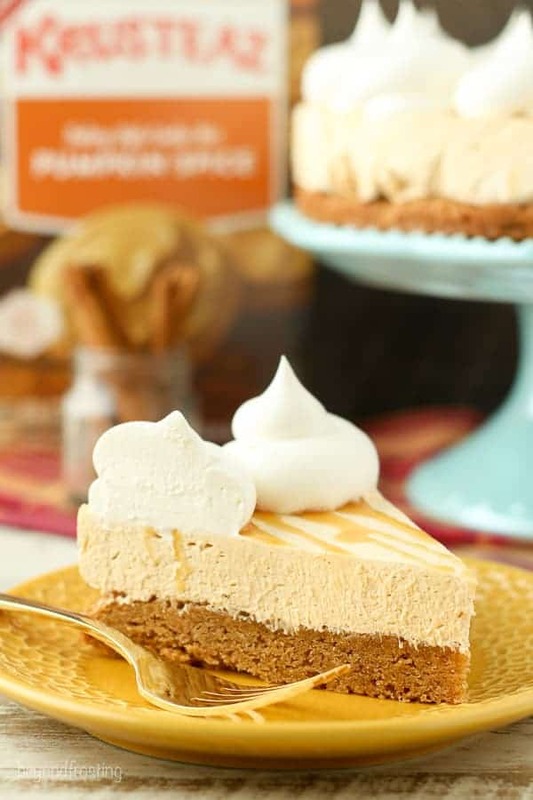 This Pumpkin Cheesecake Cookie Pie is a layer of soft-baked pumpkin cookie topped with a simple pumpkin cheesecake filling. To finish this off there’s a little more whipped cream and some caramel topping. 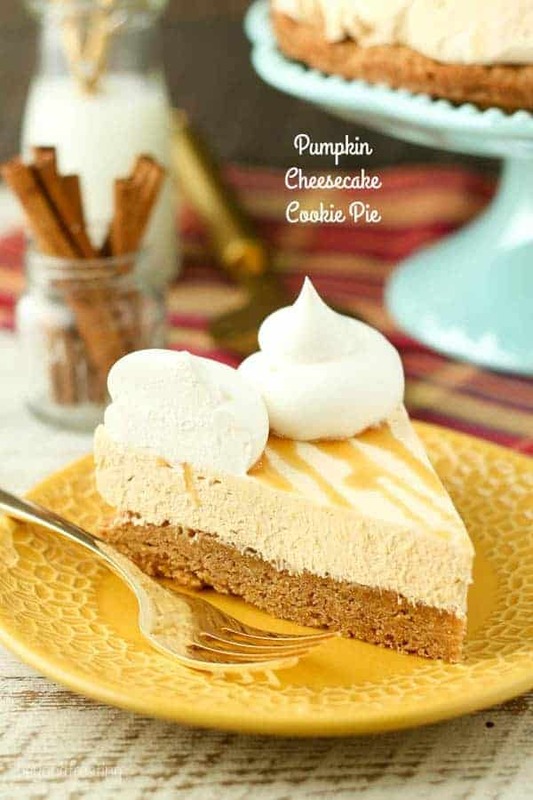 This Pumpkin Cheesecake Cookie Pie Recipe is sponsored by Krusteaz. As always, all opinions are my own. Yesterday I said goodbye to my mom, who was visiting us for the past few days. Since she retired in April, she has been on-the-go traveling to some pretty amazing places and this woman isn’t slowing down any time soon. It’s always a treat when she can spend a few days with us. Her birthday was at the end of September so we spoiled her with one of her favorite desserts from my cookbook and also some other miscellaneous sweets that seemed to pop up during the week while she was here. That woman always surprises me with her sweet tooth. One of the tasks we had to do while she was here was making some decisions regarding the invitations for our weddings and also doing a little dress shopping for her. It seems the season is a little too early for that because we weren’t able to find much in the way of long dresses. So, I was more than happy to come home early and do some baking while drinking champagne by the fire. I just love fall evenings! It’s October and you know what that means, PUMPKIN all the things! 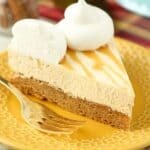 Tell me you love a good pumpkin cheesecake as much as I do? 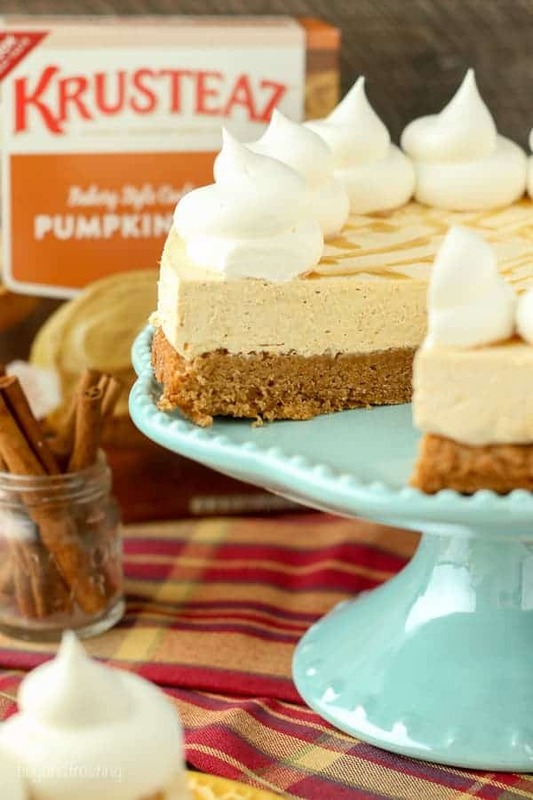 Well we’re taking it up a level today with this Pumpkin Cheesecake Cookie Pie. 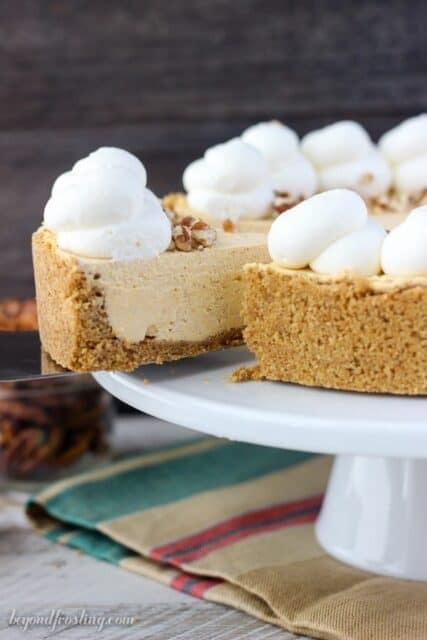 This cookie pie is a layer of soft-baked pumpkin cookie topped with a simple pumpkin cheesecake filling. To finish this off there’s a little more whipped cream and some caramel. The pumpkin cookie layer couldn’t be easier! I reached for a box of Krusteaz Pumpkin Spice Cookie Mix and a 9-inch spring form pan to make this layer. I’ve actually never tried the pumpkin spice cookie mix before trying this recipe, but everything else I’ve tried from Krusteaz has always been AH-mazing, and we’re always making a box of Snickerdoodle cookies when the craving hits. For the cookie layer, follow the recipe as listed on the back of the box. It will need just a little bit longer to bake in the 9-inch pan, but the cookie itself is just slightly under baked which helps keep it soft, even after being refrigerated! 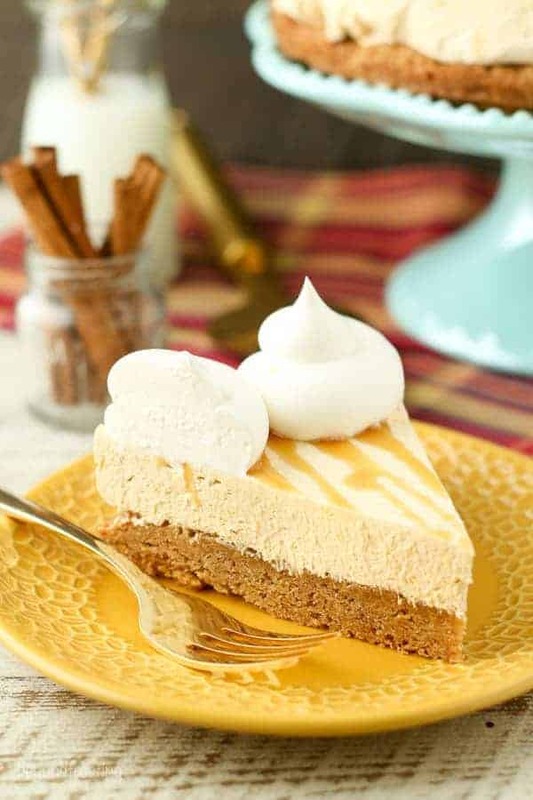 For the layer of pumpkin cheesecake, it relatively simple: cream cheese, pumpkin, brown sugar and spices, plus a little whipped cream. It’s so light and airy and just the right amount of pumpkin flavor. Plus you know I pretty much love anything no-bake. 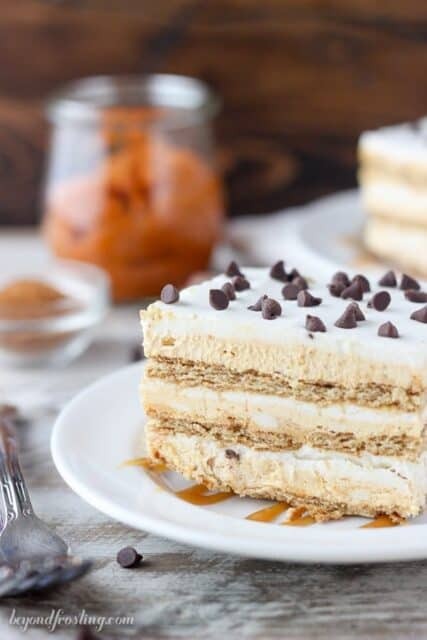 I choose to use an already prepared whipped topping because it makes this dessert that much quicker, and with a few less dishes. However, you can EASILY substitute homemade whipped cream here. You’ll need about 1 cup of heavy cream and ½ cup of powdered sugar. Prepare the whipped cream and fold into the pumpkin filling. The spring form pan allows you to build the dessert in the pan and then peel away the edges to revel those pretty layers. I line my pan with a cake collar which is an acetate piece of plastic, however you can also use parchment paper which helps too. If you don’t have a spring form pan, you can certainly also use a 9-inch square pan and cut these into bars. You could also easily double this recipe for a 9-inch by 13-inch pan if you’re serving these for a party! 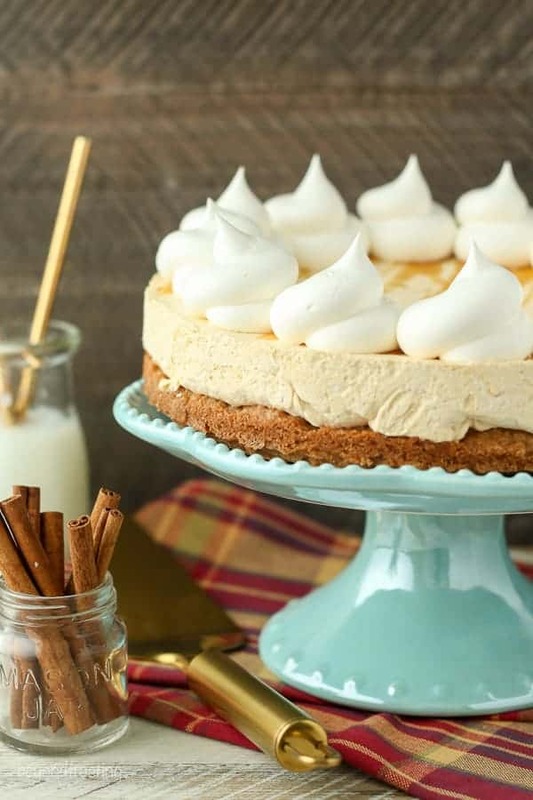 I usually have pretty good restraint when it comes to eating my own desserts but this Pumpkin Cheesecake Cookie Pie combines a few of my favorite things, which makes it even harder for me to keep this around the house. This post is sponsored by Krusteaz. As always, all opinions are my own. Preheat to oven to 350°F. Prepare a 9-inch springform pan. Line the bottom of the pan with parchment paper and lightly grease the sides of the pan. Prepare the pumpkin spice cookie mix according to the instructions on the box, combining the egg and butter and mixing until well combined. Press the cookie mix into the springform pan, patting evenly. Bake 20-24 minutes, leaving the center slightly softened. In a large mixing bowl, beat the cream cheese and brown sugar together until completely smooth. Add pumpkin puree and pumpkin pie spice and continue mixing until well incorporated. Fold in one container of whipped topping and fold into the cream cheese filling until completely smooth. Spread the filling over the cooled cookie. Allow this to set in the refrigerator for 3-4 hours. Top with additional whipped topping prior to serving and drizzle with caramel. In you do not have a 9-inch springform pan, consider using a 9-inch square pan for bars. This is so perfect! The cookie crust is such a genius idea! 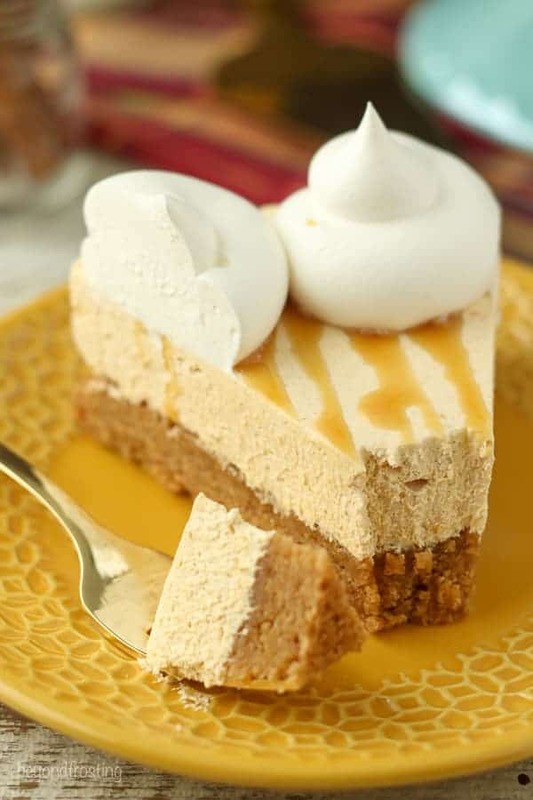 I definitely want this for dessert on Thanksgiving! Well doesn’t this just look perfect! Such a fun recipe idea using a cookie crust! This looks delicious for the holidays!